The Android version of Twitter’s live video streaming app Periscope – which was launched last month – has scored yet another update. It bumps the application to version 1.0.2, and brings along several new features as well as bug fixes. The updated app now not only lets you edit your profile information, including your photo, display name, and description, but also allows you to watch your personal broadcast history. 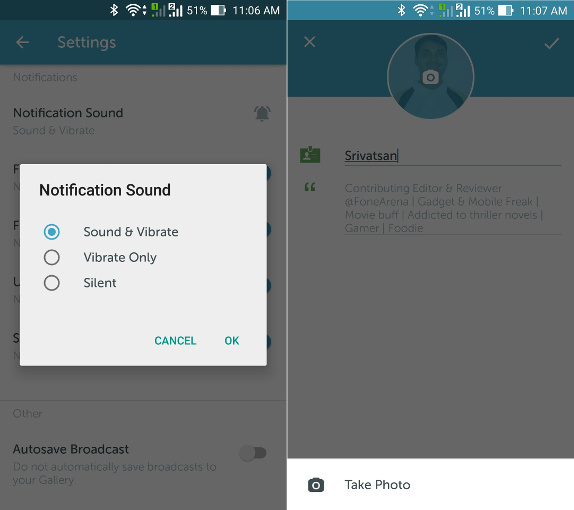 In addition, it brings along improved comment synchronization for replays, as well as new sound/vibrate/silent notification settings (see image above). Periscope for Android (v1.0.2) is now available for download from the Google Play Store (click the Source link below).